Z-SERIES zero air generator produces a continuous flow of air with a minimum content of hydrocarbons, for FID, NPD, FPD, THA, TOC applications, directly on site, without any waste. The functioning of “Z consists in removing hydrocarbons from ambient air through a heated catalytic reactor. 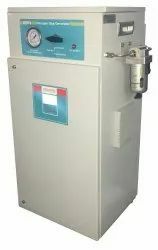 Zero air generator for toc analyzer produces a continuous flow of high purity zero air at selected pressure. Compressor takes the air from atmosphere, the hot air is than passed through copper cooling coil. The cool air is than passed through furnace where hydrocarbons are cracked at high temperature (Temp. Range - 400ºc to 500ºc) in presence of catalyst. 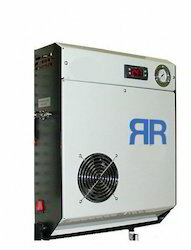 Being the well-distinguished companies in the market, we are into offering Zero Air Generator. Our principal F-DBS, France offers comprehensive range of Gas generators - Nitrogen, Hydrogen and Zero Air generators. We are foremost company in offering wide assortment of Precision Zero Air 18L Generator. Peak Scientific Instruments (India) Pvt. Ltd.
- Zero Air Generator produces a continuous flow of high purity Zero Air at selected pressure. - The modular pressure swing adsorption (PSA) unit operates with alternating pressure increase and decrease.